NVIDIA Home > Support Home Page > Knowledgebase Home Page > How can I determine which motherboard and system BIOS (SBIOS) I have in my PC? 1) When your system boots up during P.O.S.T (Power On Self Test), this information can be obtained from the monitor screen. On some PCs, you'll probably see the manufacturer's company logo so you may want to consider downloading a program to retrieve it. After the program launches, click on the Mainboard tab. 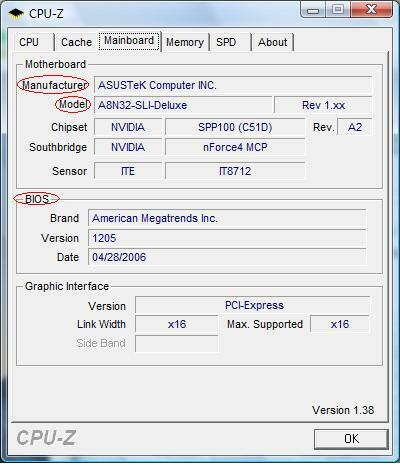 From this page you should be able to obtain the manufacturer, motherboard model, SBIOS and motherboard related information. Are there any special motherboard requirements for 3D Vision Surround?